There was a huge buzz surrounding this match, with André Villas-Boas's Tottenham going up against his former club. Would the Portuguese manager instigate his team to go all out from the referee's first whistle or would the Lilywhites be more cautious? While Chelsea were without John Terry (suspended) and Frank Lampard (on the bench), Tottenham were also without two key players: Moussa Dembélé and Gareth Bale, meaning Tom Huddlestone would partner up with Sandro in midfield and Dempsey would deputise on the left. Unfortunately for Tottenham, those absences were far more critical than Chelsea's and it showed throughout the whole match. With neither team interested in pressuring up front, Roberto Di Matteo's team were clearly more sure of themselves and more comfortable on the ball. Without Bale's defensive contribution and Dempsey not willing to track back that quickly, Chelsea kept venturing down the right wing, constantly creating overloads. 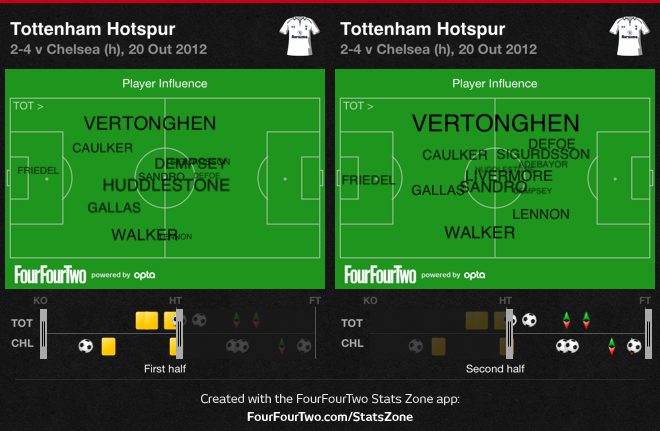 Tottenham showed huge difficulties in playing out from the back. With neither Gallas or Caulker particularly adept at spreading the play, a player like Dembélé is critical, since he can hold up the ball and glide through opponents before spraying passes. Furthermore, this is a team based around Bale's sheer speed for the out-ball, a trait that was canceled due to Dempsey's altogether different characteristics. The simple shifting of the American midfielder into the wing caused not only inefficiency down the left flank, but it also removed Desmpey's bite in the centre, where he excels at picking up the scraps from his striker, unlike Sigurdsson. The Icelandic, in turn, was playing too high up to help out defensively, but didn't create anything going forward - as is often the manager's intention when deploying such a player that high. 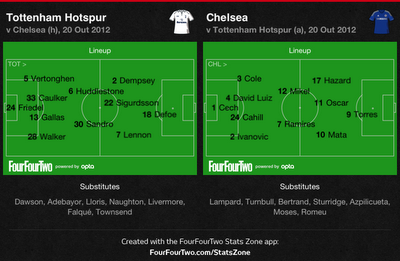 AVB would realise that and Sigurdsson and Dempsey would eventually change positions midway through the first half. For a team with such ingrained routines down the left, Aaron Lennon had to step up, which he didn't until the 25th minute, immediately spreading the panic in Chelsea's defence. He would in fact create Tottenham's best opportunity for Sigurdsson ten minutes later. Chelsea were winning by half-time and rightly so. The second half was entirely different. Tottenham were finally unafraid of pushing up and make Chelsea's midfield duo work, which yielded results almost immediately, through Gallas' goal on 46 minutes. A few minutes later, the home team would score the second when Defoe redirected Lennon's mishit shot. While Tottenham's first 15 minutes were in part due to their greater intensity and dynamics, Lennon's input cannot be overstated, since he was the only home player (with the exception of the ever impressive Jermaine Defoe) capable of beating opponents on 1v1 situations, dragging them out of place. with the whole team wider and more advanced. The match now seemed to be Tottenham's to lose. Chelsea were somewhat lost and looked incapable of turning things around. Even though Mata and Hazard's role in the final comeback was absolutely critical, there were two factors that played their part against Tottenham: Gallas' waning capabilities and the midfield's lacklustre protection of their back four. 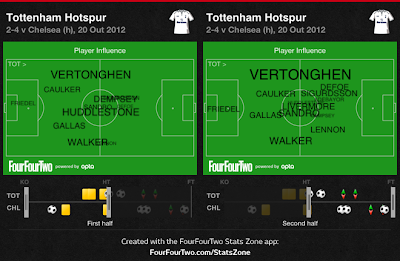 Bale's absence was obviously important, but Dembélé's might have been worse. In addition to his ability to constantly offer an out-ball, his defensive performance is just as relevant. The chalkboard above shows how differently Sandro and Huddlestone helped out their team while defending, a difference that only became clearer as the match wore on. 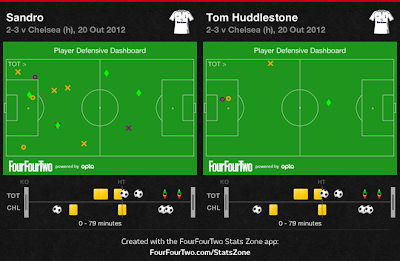 In fact, Huddlestone's exhaustion was a direct cause of Chelsea's second goal and his replacement came moments too late. 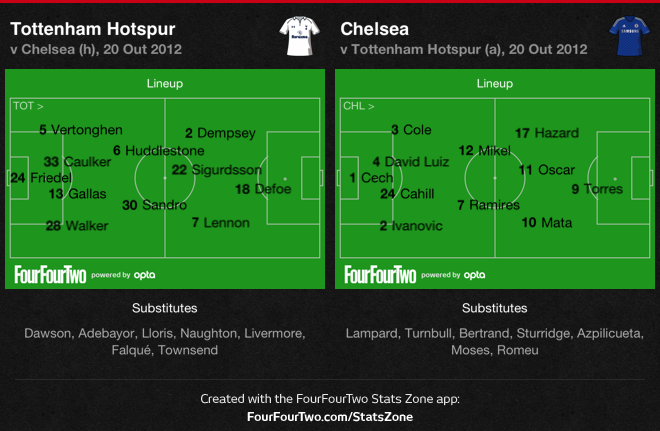 As for Gallas, the return of either Kaboul or Assou-Ekotto cannot come too soon for AVB. Despite his impressive, title-winning track record, the French centre-back's limitations are plain for all to see. Unfortunately for him, he's not the same solid, reliable match-winning defender he used to be and today's match further exposed him. Not only has his positioning become questionable - resulting in misdirected clearances -, his reading abilities also seem to be deserting him, of which Chelsea's third goal was enough proof. This was a match that Tottenham could and should have won after getting on top, were it not for a few critical shortcomings in midfield and defence. Dembélé and Bale will be back soon, as will Parker, Kaboul and Assou-Ekotto, which will only make them stronger. Despite the loss, André Villas-Boas can take comfort in knowing his team are evolving and on their way to become a squad strong enough to look their opponents in the eye.